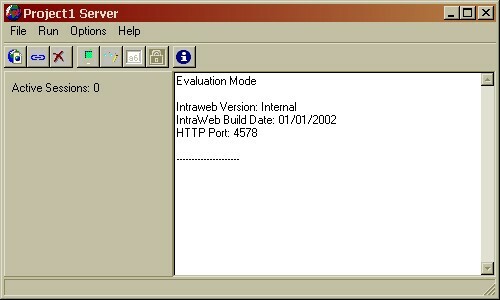 his application is built using IntraWeb Borland Edition and application mode. 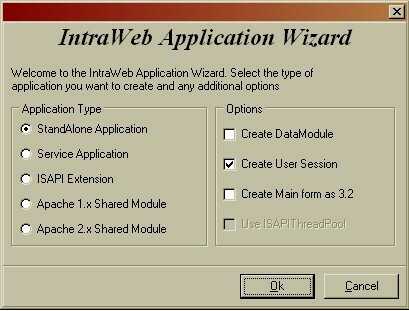 Using this dialog you can start a new IntraWeb application or add new IntraWeb forms to your existing applications. For this application we'll select "StandAlone Application". This will produce a self contained executable, that will be the only thing on the server side that you'll need to run your application. You do not need a web server of any kind. Notice the other available options: you could make your application a Windows service, and ISAPI extensions for web servers that support ISAPI, like IIS and OmniHTTPD, and even an Apache module. The options in the right panel specify whether the application should have a DataModule by default, if support for user sessions will be available, whether the HTML output should be 3.2 or 4.0 (default is 4.0 unless you check the "Create Main form as 3.2" box) and if the ISAPIThreadPool unit should be used (for the IIS server only). 1. Project1.dpr - This is the project file. 2. Unit1.pas and IWUnit.dfm - This is the main form of your application. You can change this by editing the project file, or even have multiple main forms determined by an incoming HTTP variable. 3. ServerController.pas and ServerController.dfm - This is the server controller and used to configure your IntraWeb application and create application level events. In a new application you can leave all properties as default. If you want, you can rename any of the files by doing a Save As from the File menu. 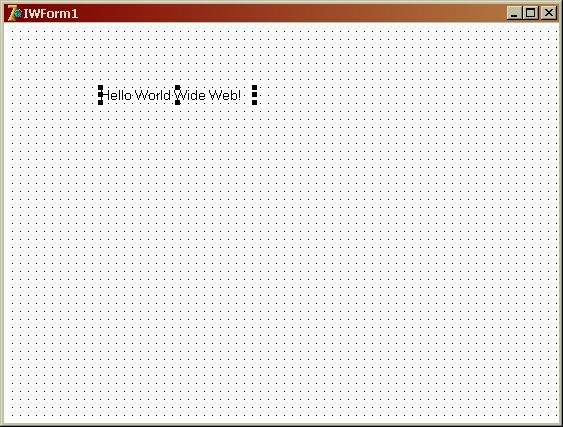 If you have worked with other web technologies you are probably gearing up for a very big tutorial on simply how to implement even the simplistic "Hello World". I hope we will not disappoint you, but this tutorial will be very short, but only because IntraWeb makes this so amazingly simple. In the standard palette you'll see the base components for web development. However, that's not all. You an look in the other IntraWeb palettes to see components for database access, HTML 3.2 output, client side processing etc. 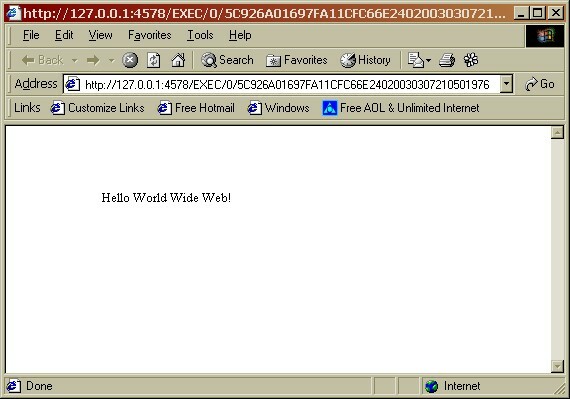 For a complete reference of IntraWeb components, please see the IntraWeb Reference file. You can download this file from the Atozed Software website. Now all that is left to do is to run the application and test it. We have created this application as a stand alone application. What this means is that it will execute completely stand alone and become its own web server. This is extremely useful for debugging and testing, but it can also be deployed in this manner. Not only can it run stand alone, but it can be installed as a service on Windows NT, Windows 2000 and Windows XP. Please see the IntraWeb documentation for more information on this. This is a dialog to assist you in testing and debugging. To test it in the browser click Run then Execute or press the F9 key. Congratulations! You have just created a web application! 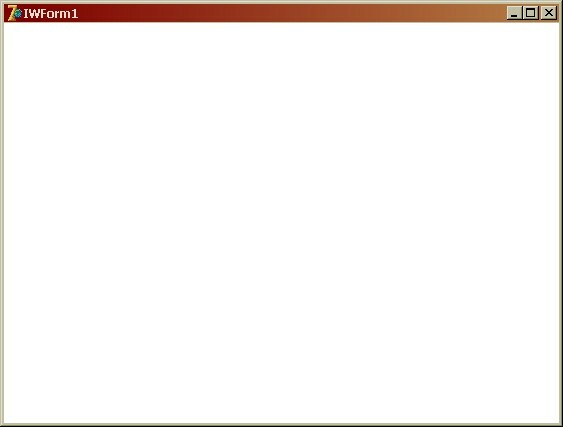 All of this with no HTML, and it was just like a normal Delphi application was it not? Now you might say "Well that is fine and dandy, but what about input? You are just showing us limited pieces and there are hidden gotchas." Trust me, there are no such "gotchas" waiting for you. 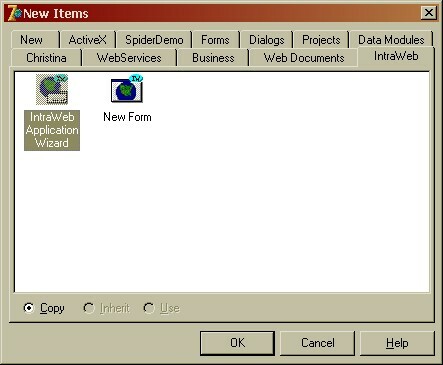 IntraWeb handles input just like any other Delphi application. Want to handle a button? Define the OnClick event, that is it. Want to read the value of a text box? Read its text property. 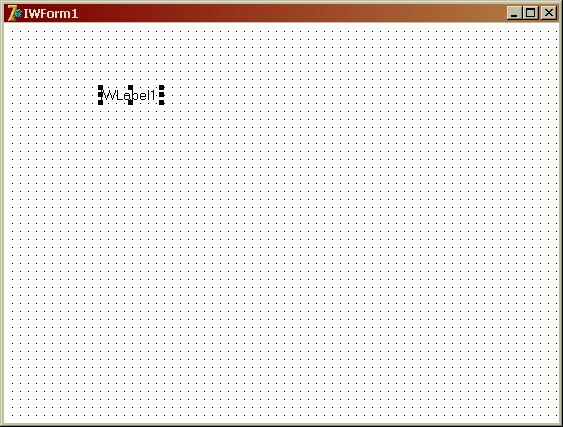 · See the next tutorial - User Input. · Download the fully functional evaluation edition and look at the demos.